Weathered bedrock on hillsides can store a significant amount of rock moisture inside its fractures and pores. 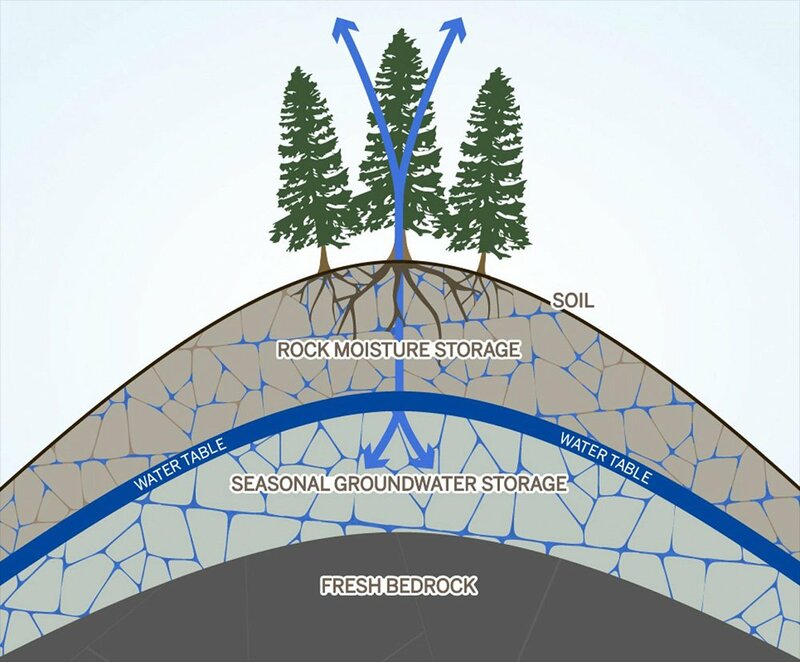 Tree roots tap into the rock moisture and release it back into the atmosphere as water vapor, while water flows through the fractures and becomes part of the seasonal groundwater storage (blue arrows). An oft-neglected layer of weathered rock underlying the soil on hillslopes could be a significant reservoir for water, providing critical moisture for trees during droughts, according to a new study by scientists from UC Berkeley and the University of Texas at Austin. 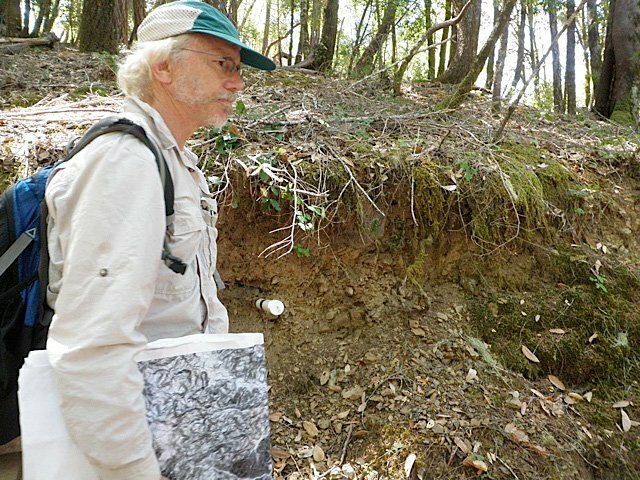 William Dietrich, a professor of earth and planetary science at UC Berkeley, and former UC Berkeley doctoral candidate Daniele Rempe, now an assistant professor of geological sciences at UT Austin, have studied this underground layer at Angelo Coast Range Reserve in Mendocino County. 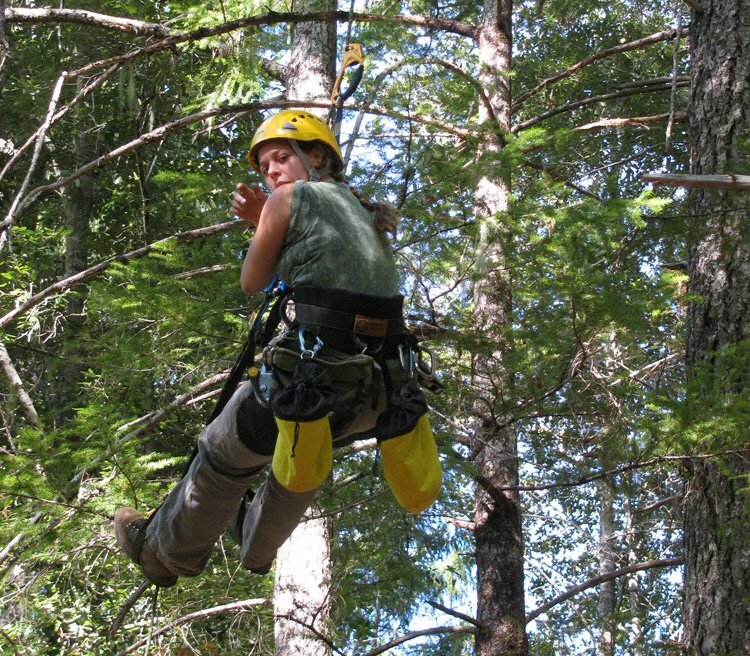 Part of the UC Natural Reserve System, the Angelo reserve is the field site for the Eel River Critical Zone Observatory, which helped support this work. At Angelo, the scientists have followed water in the environment from the time it falls to the time it trickles into streams or is taken up by plants and returned, via respiration, to the atmosphere. Researchers on a hill slope at the research site above the Eel River. Prior work had predicted the thickness of this weathered bedrock. The new study shows for the first time that this layer gains and loses significant quantities of water moisture annually. Much is already understood about how water moves through the rich surface soil. But beneath the soil, on hillslopes developed on bedrock, weathering can generate cracks and pores through which the water readily travels as it makes its way to streams. This layer, part of the earth’s critical zone – the region from the tops of the trees down to fresh bedrock – has been difficult to explore. In mountainous areas, including Angelo Coast Range Reserve near Laytonville, this region can be 80 feet thick – far thicker than the veneer of soil. In a study published this week in the Proceedings of the National Academy of Sciences, Rempe and Dietrich report that at this site, the weathered rock zone can store up to 27 percent of all the rain that falls over the course of a year. They refer to the water stored in the weathered bedrock as “rock moisture.” This is water clinging to cracks and pores within the weathering bedrock that is used by vegetation. They found that even in drought years, when the soil dried out, rock moisture was available and only slowly declined as the deep roots of trees pulled out water during the summer and fall. While the impact of rock moisture will vary depending on the region and topography, Dietrich said, rock moisture likely explains how trees in the study area showed little effect from the severe 2010-2015 drought, which killed more than 100 million trees throughout California. Dietrich said that a major implication of this study is that global climate models, which don’t take rock moisture into account, may greatly underestimate the level of transpiration return to the atmosphere and the consequences of that. They thus predict lower humidity and higher temperatures than will occur, and don’t predict the dominant vegetation correctly in future climate states. One of Dietrich’s colleagues at UC Berkeley, Inez Fung, is now developing a model specifically to explore how to include rock moisture and fracture flow processes in a climate model. The researchers monitored rock moisture from 2013 to 2016 at nine wells drilled into the weathered bedrock along a steep forested hillslope. They used a neutron probe, a precision tool that measures the amount of water in a sample area by detecting hydrogen. They found that the weathered rock layer built up a supply of 4 to 21 inches of rock moisture during the winter wet season, depending on the well. The maximum amount of rock moisture in each well stayed about the same throughout the study period, which included significant drought years This water was then progressively depleted by trees. Researchers also found that the average rock moisture at all wells exceeded the average soil moisture measurements at all locations. 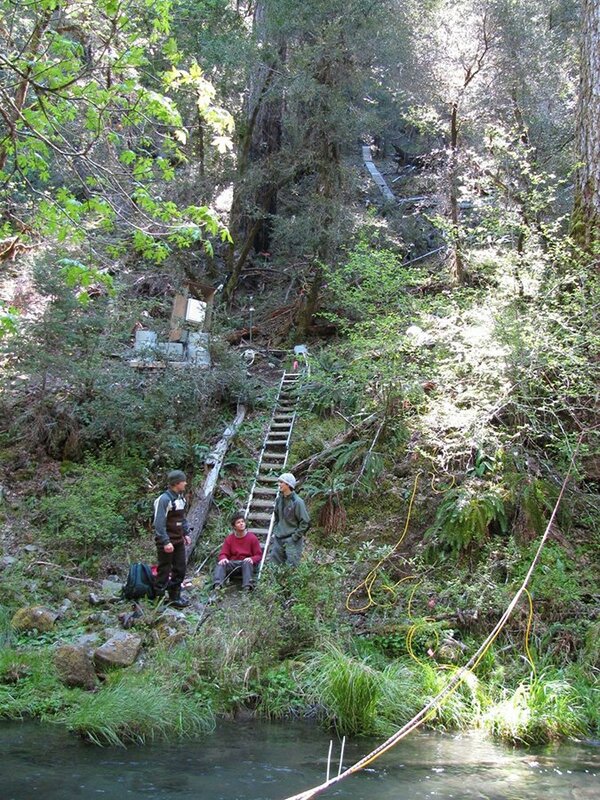 The new findings also could help understand the role of trees in regulating river flows during the summer, at a time when the spread of Douglas fir trees along California’s north coast is being blamed for reduced summer stream flow. The research was supported by the Keck Foundation, the National Science Foundation, and the University of California Natural Reserve System.